It’s all getting quite confusing to those who are looking for safer and better alternatives to traditional plastic bags to store and dispose of their waste. But are these so-called alternatives truly safe? Degradable: That undergoes significant changes in its chemical structure when subjected to various specific environmental conditions, resulting in a loss of properties that can be measured by standard methods, in a given period of time. Compostable: That undergoes degradation by biological processes during composting to yield CO2, water, inorganic compounds and biomass at a rate consistent with other compostable materials and leaves no visible, distinguishable or toxic residue. Various terms are being used to describe this particular type of plastic: Biodegradable, photodegradable, oxydegradable, etc. Please note: They are all the same. These are regular petrochemical-based plastics and may take decades or even centuries to break down. Moreover, when they finally degrade, they will leave behind toxic residues. In this case, the regular plastic is woven, rather than blow-moulded, so that they form a net and will simply penetrate the soil and get depolymerised into smaller fractions due to UV light and biodegradable additives. They have the same negative impact on Nature just as the regular plastic in terms of carbon footprint. The degree of the damage may vary a bit. Back in 2012-13, I ran a trial run of bio-compostable bags involving 10 more residents in our community and realised that they were not a magic-bullet solution as promised. They remained intact for nearly 6-8 months. Only the overall size shrunk a bit but there was no disintegration as such. Imagine composting 100s of such bags in a day! You will end up with another pile which will take six months or even more to compost (just one batch). Apart from biodegradable and bio-compostable, you might have also come across discussions on the safety of using bioplastics. It’s quite important to understand this category of plastic as these jargons can get mind-boggling. Bioplastics are made from natural materials, predominantly corn starch and whole cereal grains. They look very much like traditional plastic bags. But unlike the latter and also biodegradable plastics, bioplastics generally do not produce a net increase in CO2 when they break down. Moreover, some bioplastics are compostable as they break down, decay and blend with soil. However, there’s a big BUT lurking around here. Not all bioplastics can be harmlessly composted. While some can be, “others leave toxic residues or plastic fragments behind, making them unsuitable for composting if your compost is being used to grow food”. According to one source, certain bioplastics degrade only when placed in a commercial or industrial composter. In other words, it may not be suitable for your household or community level composting system where the process goes on at lower temperatures. With already 13 different types bioplastic being manufactured globally, it will be hell of a task to pick and choose the safest one for each one of us, educated or not. For an uninformed consumer, these many categories are too much to handle. This particular anomaly must be viewed with greater concern especially in India where industrial norms to protect environmental ethics can be torn asunder anytime. No matter which one you opt for, none of them offers you a practical solution. Certain types of bio-compostable bags take too long to compost. Even if you are ready to put up with this mess, you will be burdened by the longer turnaround time of your compost batches. You will also face odour issues as these bags can lump up and cause anaerobic microbial proliferation inside the compost pile. Segregating them into different categories is nearly impossible for pourakarmikas or your own housekeepers. When thrown around at will, which is usually the case, they can choke the drains and animals might even chew on them. When they enter a landfill, they produce methane, especially the biodegradable ones. Above all, if any unscrupulous manufacturer labels a biodegradable bag as a bio-compostable one, the consumer is the one who stands to lose on all fronts. In a country where a sizeable population goes hungry every single day, using such bags made from edible food material just for the sake of one-time convenience amounts to poverty of philosophy. Setting aside huge tracts of land to grow these bags is not something a country like ours can afford. When we opt for bio-compostable bags, apart from convenience, we are only looking at its eventual degradability. We must spare a thought over its embedded carbon footprint right from growing the edible raw material using water, seeds (GMO or otherwise), nutrients, chemical fertilisers, pesticides, labour, etc., to shipping it to manufacturing units and from there the end product to distribution centres, retail outlets and finally, to your home. It has to travel these many miles only to serve its purpose of lining your bin for a day or two! If this is not rank arrogance, what is? This entry was posted in Endlessly Green and tagged bio-compostable bags, Biodegradable bags, bioplastic bags, bioplastics, compostable bags. Bookmark the permalink. Bio-compostable bag, has Embedded Carbon Footprint due to * growing edible raw material using water/ seeds (GMO or otherwise)/ nutrients/ chemical fertilisers/ pesticides/ labour., * shipping to manufacturing units and from there * shipping the product to distribution centres/ retail outlets / to your home. It has to travel these many miles only to serve its purpose of lining your bin for a day or two ! The usage rate and geographical spread of Bio-compostable bag would deliver a sizeable Carbon Footprint (unseen since Embedded). Can we have some idea of the size of embedded Carbon Footprint linked to bio-compostable bags (some rough idea) ? Can bio-compostable bags be made from non edible bio matter ? I cannot agree more. All these terms are jargon to confuse the user. Many people do not know the difference between natural, organic, biodegradable and compostable. Once we understand this, we’ll start examining labels closely! I now make my body lotion, deodorant, toothpaste and soap. and I use reetha or soap to wash my clothes with. A small test can be performed at home to know if the bags you have bought are compostable or no. If they are actually made of corn starch or any organic material. Buy iodine tinture from a medical store. Pour some tinture over your bag if it is from starch materials it will absorb this tinture and become brown golden color. If not the iodine tinture will just be on the bag. Dear Firdosh, thanks for the info. But once we pass the test, what next? Start using them for just a day’s convenience? I have written that this science does exist. One may find a genuine/degradable/compostable bag. I am not disputing that. But I have explained already why I don’t support this technology in the first place. hi i fully agree to what ever you have mentioned inn your post. the Ahmadabad product passed the test while the Bangalore & china product of corn starch bags failed. i even put all 3 samples in my composting pit, the Ahmadabad product disappeared. secondly what i concluded from this corn starch bags, is that the advantage of the product i.e being compostable or degradable becomes its disadvantage within a year. the actual corn starch bags i had stored with me started shredding off on their own within 6 months. any ways thank you for your reply, i do follow your posts and your posts do help me a lot in convincing some of my customers about the debate on composting in pits vs composting machines. i have a small business in pune since 2010 , named “The Green Thumb”. i take contract of housing societies for recycling their kitchen waste and garden waste to compost. i have contract with 27 societies in pune. Hi Firdosh, much thanks for both replies. It’s always better to have info on such matters. No two words on that. Nice to know about your green venture. Do connect with me on FB. There maybe people in need of such services. What DO you advocate for kitchen bin liners? The skins of water-melon, musk-melon and some vegetables are drippy and the water seeps to the bottom of the bin. Using paper as liners is just not feasible. I have always been using paper lining. No issues. I would like to get rid of paper too but the composting method we have in our community works well when there is a little less moisture. It created problem when the entire community went without paper lining. So we had to switch back. Perhaps you could use one more sheer of paper. But the best is not to have any lining. Rinsing doesn’t take long. Thanks. try and look at this from another perspetive, YOUR watermelon, YOUR musk melon and YOUR vegetables, which you happily ate and enjoyed their nutrition. now after the eating comes the part of throwing (we are so used to this throwing and disposal) . WHY ?????? – dont you start composting such easy vegetable and fruit skins in your own house. problem solved @ bins and bin liners… isnt it. but ….. NO NO NO composting in my house , eeeks it smells. i can’t do it, waste recycling in house is not good for vastu. so on and so forth. if you cannot recycle / reuse / and REDUCE your own waste no one can actually suggest you the right method. There is a big confusion on your Biodegradable and Degradable information. As you rightly differentiate them on the first paragraph, Biodegradable and Degradable are NOT all the same. In fact the Degradable section should refer to the Oxo products which are harmful as when they break down they leave micro-plastics residues in the atmosphere. 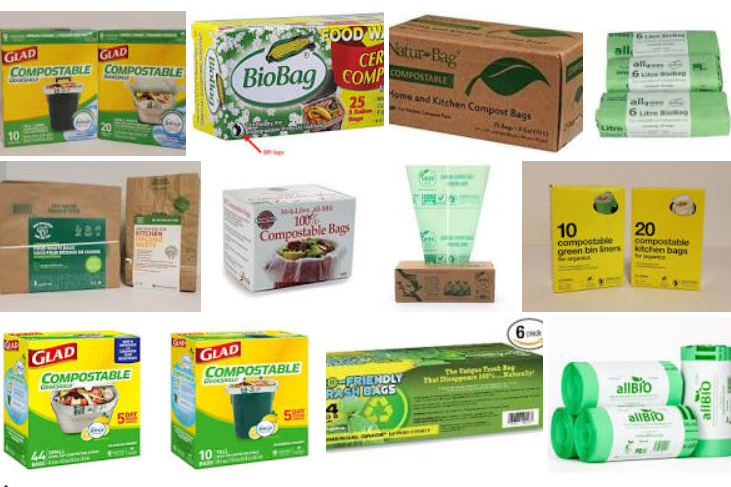 On the contrary Biodegradable products degrade by the ingestion and digestion of the product by microbes and bacteria. Dear Jane, thanks for the comment. I will study the links you have given. Thanks again. Hello Endlessly Green, Wonder if you have any updates on biocompostible bags specifically ones from MobiTrash? Would really appreciate any information as our society and possibly our entire small locality would like to provide all flat owners with the best options. Thanks so much. Hi Tehnaz, I have already written about biocompostable bags. Please search for the same in my blog. I have no specific information on MobiTrash. But in general, biocompostable/biodegradable bags are better avoided. You will find ample reasons for doing so in that blogpost. Thanks for connecting. Oh sorry, this was the same post I was referring to. Why this reluctance in going in for compost bins in each dwelling? Does not cost the sky, occupies very little space, gives out the best compost, definitely keep public spaces clean, green and vermin free & does not stretch the scarce resources of local bodies. But there are not many takers for this concept.